Powers/Abilities: Bill is a tough and tenacious individual, and a dab hand with a shotgun. History: (Disaster 1990, Prog 119-139) In 1990 a nuclear submarine exploded at the North Pole, melting most of the polar ice cap. This caused an immediate rise in water levels around the globe, and Britain was caught in the path of an immense tidal wave that submerged vast portions of the country. Truck driver Bill Savage was amongst the survivors. For several months, until the waters finally refroze and receded, he fought against a variety of threats to survive. (Invasion, Prog 1-51, 2000 AD Annual 1978, 1979, 1980, Dan Dare Annual 1979, 2000 A.D. Summer Special 1977) In 1999 war erupted in Europe as the Volg Republic, formerly part of the Soviet Union, launched an invasion. Britain fell quickly under the onslaught, and Bill Savage, his family killed in the fighting, took up arms as a major resistance figure. In 2002, he escaped to America in an attempt to return the then-prince to the safety of Canada. Since the Volgans killed the crew of an American ship trying to stop his mission, Bill thought the Americans would join the war, and help drive the Volgans out of Britain. Instead, the USA did nothing, as they had signed a treaty with Volga. Disillusioned, Savage returned to Britain, faking his own death and having had plastic surgery done so he could assume the identity of his dead brother Jack. From 2004, he fought from within London- unlike his earlier exploits, he was focused more on subterfuge and terrorist bombings. Comments: Created by Pat Mills and Jesus Blasco. Reprints of some of his early stories appeared in 2000 A.D. Annuals 1982-1984. Having been one of 2000 A.D.'s first strips, and a reasonable success, Bill was brought back in Disaster 1990, a prequel. This story, written in 1979, was set in the then still distant future of (you guessed it) 1990. In Prog 500, 13th December 1986, Bill Savage was seen in a story set in Tharg's mind ("Tharg's Head Revisited"), where he was seen to be deleted from Tharg's memories as one of his few "clinkers" (see right). That attitude continued to prevail during the 1990s, when Bill was generally only remembered as some kind of joke, appearing in Armoured Gideon among the dead characters, and cameoing in Prog 1034's parody Invasion 3000 A.D. and the 25th Anniversary story "Tharg: A Night 2 Remember" in Prog 1280. 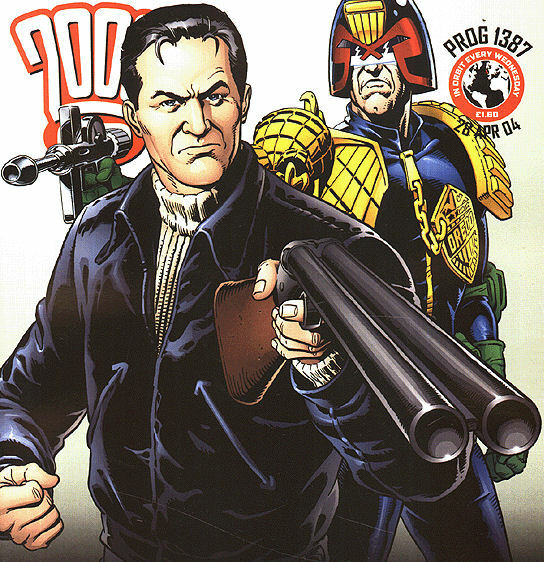 Ironically considering this, beginning in May 2004 Pat Mills and Charlie Adlard brought back Bill in the strip Savage, which rapidly became a fan favourite. Thanks to Charles Ellis for information on his newest stories. Vandal Savage, an immortal DC villain.